I had not read any Oscar Wilde since high school, and even then my exposure had been limited: a single play, perhaps an essay or two, some of his more famous poems, and of course those glorious, decontextualized epigrams and aphorisms, still widely quoted today, that have immortalized Wilde’s reputation for wit. This Penguin Classics edition – another fortunate used book sale find – collects some of his best known plays in chronological order: Lady Windermere’s Fan, A Woman of No Importance, Salomé, An Ideal Husband, A Florentine Tragedy and The Importance Of Being Earnest, omitting only his earliest plays (Vera and The Duchess of Padua) and a single fragment, Le Sainte Courtisane. 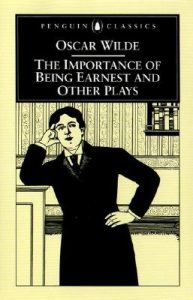 This arrangement, together with the end notes detailing his various revisions, gives readers an important glimpse into his development as a dramatist, and an even more poignant reminder of what an immense talent we were deprived of, for his most polished play, The Importance of Being Earnest, debuted on London stages mere months before his arrest for “gross indecency.” Wilde survived his two-year term in Reading Gaol, but the light-hearted dramatist within him died. It is right that they should be punished, but don’t let them be the only ones to suffer. If a man and woman have sinned, let them both go forth into the desert to love or loathe each other there. Let them both be branded. Set a mark, if you wish, on each, but don’t punish the one and let the other go free. Don’t have one law for men and another for women. You are unjust to women in England. And till you count what is a shame in a woman to be an infamy in a man, you will always be unjust, and Right, that pillar of fire, and Wrong, that pillar of cloud, will be made dim to your eyes, or be not seen at all, or if seen, not regarded. At no other point, in any of the other plays, does a character lecture with such moral certainty, and Wilde’s audience would have understood, as surely as they caught the references to Genesis and Exodus, that this lecture is intended for them as well. Lady Bracknell: I have always been of opinion that a man who desires to get married should know either everything or nothing. Which do you know? Jack (after some hesitation): I know nothing, Lady Bracknell. Lady Bracknell: I am pleased to hear it. Marriage, the necessary conclusion of any good comedy, comes in for quite a drubbing in Wilde’s work – perhaps unsurprisingly, given his sham marriage to Constance Lloyd. Lord Illingworth, in A Woman Of No Importance, seems to speak for Wilde at his most pessimistic when he declares that “Men marry because they are tired; women because they are curious. Both are disappointed.” Or that “When one is in love one begins by deceiving oneself. And one ends by deceiving others. That is what the world calls a romance.” Part of Wilde’s triumph as a dramatist – evident, especially, in the revisions he made between stagings – was his ability to balance out these many voices, all aspects of his own personality. To read Wilde, or watch him staged, is to watch a mind engaged in a kind of debate with itself, with characters and situations offering only the pretence for the next bon mot. And only in Wilde’s case could such a conclusion be a compliment.